"Certain things may catch your eyes..."
"but pursue only those that capture your heart." 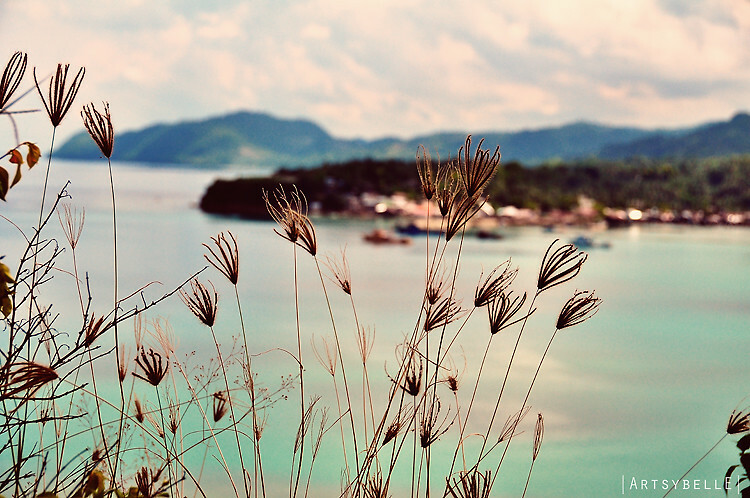 The land and seascape in the background is one of the famous spots in Southern Cebu. The place evokes a serene and calm atmosphere, very provincial, and the scenery is just beautiful. This place is most often photographed by town visitors or tourists passing by on their way to other famous attractions in the South. In fact, a couple of years ago, I took a picture of the same spot, but this time around I want it to be different because I know that there is something else about the place that adds to its mystic. Then, I find these weeds flourishing by the cliff (yes, just a step away from where I took the shot is already a cliff and it's a hundred or more yards down below). The weeds' resilient glory and an all day vantage point to a wonderful view, which made me jealous, captured my heart and propelled me to take the image.